Compatible with iPad 9.7 (2017 & 2018), iPad Pro 9.7, iPad Air 2, iPad Air, 9.7 inch. Edge to edge coverage makes the protector and your device perfect match. 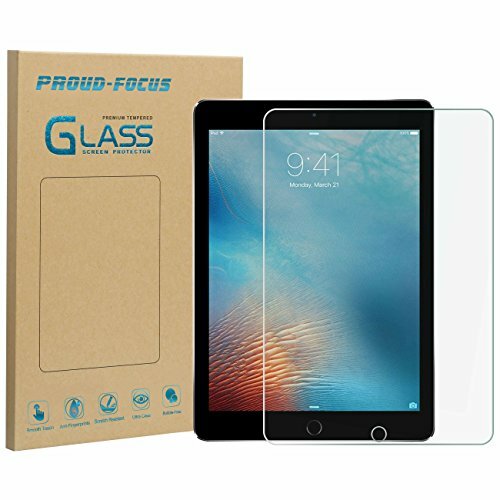 The premium tempered glass is coated with shatter-proof layer. It provides a firm protection which can disperse the impact from accidentally drop and scratches. In extremely bent test, the glass won't crack into sharp pieces which may cause injuries, instead, it breaks into spider webbing. 18 strict tests are applied to the glasses, including ball-drop test, 120 degree bent test. The advanced silicon in the adhesive wipes air automatically. Just slide your finger across the glass, and it will adhere to the screen itself. No bubble, no worry! It also allows you to peel off the glass to re-align if you're not happy with your first job. No residue left on the screen! The vacuum oleophobic layer in the product prevents the fingerprints and oil, and refreshes your device as a new one! Is it your first time to do it by yourself? Don't worry, our installation video (scan from barcode on the package or Installation Guide) walks you through every step. This product carries with 100% satisfaction warranty. Any issue, please feel free to contact us, we are eager to serve you! Specially design for iPad Air 2 / iPad Air / iPad Pro 9.7 / New iPad 9.7 2017 & 2018 (Education Edition), apple pencil compatible. 2.5D round edge design makes you feel more comfortable. Bubble free application! Get rid of bubbles, get out of troubles! The advanced silicon wipes air automatically! Not satisfied with your first job? Just lift up to adjust, and no residue on the screen. Compatible with multi-touch and Apple Pencil. Fingerprints and rough touch of your screen always annoy you? No problem, adhere with us, our protector makes your iPad a NEW high transparent and fast responsive one! If you have any questions about this product by Proud Focus, contact us by completing and submitting the form below. If you are looking for a specif part number, please include it with your message.